Specialists have discovered new malware that seems to be the newest variant of Rapid Ransomware. It has been named Rpd Ransomware. It would not be fun to encounter this infection because it not only uses the AES encryption algorithm that is considered one of the most secure ciphers in the world, but also encrypts almost all files it finds on affected computers, even executable ones. It only leaves those files that are used by the Windows OS untouched. Rpd Ransomware leaves no chance for users to unlock them by deleting Shadow Copies of those files. It executes the following command to do that: vssadmin.exe Delete Shadow /All /Quiet. Instead, the ransomware infection seeks to push victims into paying a ransom to its author. The ransom note dropped by Rpd Ransomware on affected computers does not include any information about the ransom, but we can assure you that this infection only wants your money. Do not send a sent to malicious software developers. The ransomware infection will not be removed from your system no matter what you decide to do, and, on top of that, there are no guarantees that you will get the decryptor for unlocking your files from cyber criminals. Once Rpd Ransomware infiltrates computers, it not only encrypts files and deletes their Shadow Copies. Research has also shown that it creates a copy of itself (info.exe) in %APPDATA%. 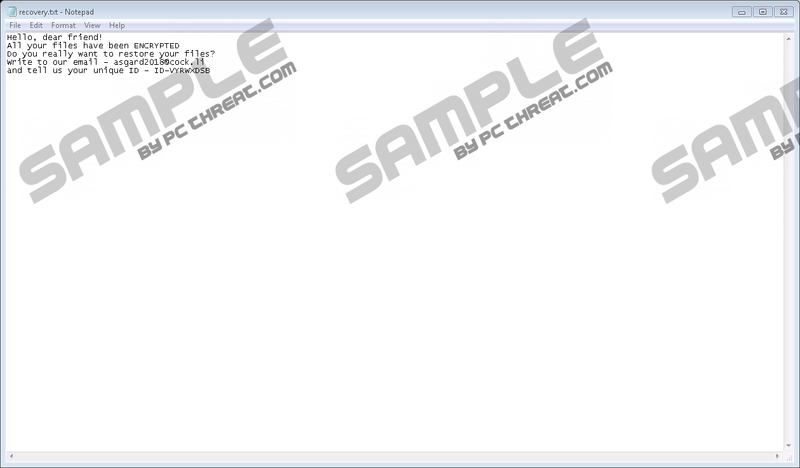 You will also find two new entries in the Run registry key (HKCU\Software\Microsoft\Windows\CurrentVersion\Run): userinfo and Encrypter_074. Last but not least, there is no doubt that Rpd Ransomware is the one that has locked files on your computer if you can locate a new task named Encrypter in %WINDIR%\System32\Tasks. All these modifications it makes clearly show that this malicious application is quite sophisticated. Without a doubt, Rpd Ransomware enters computers to lock files on them. As mentioned, it seeks to extract money from users. Have you found your files locked by Rpd Ransomware? If so, it does not mean that you should hurry to send money to its author. We know well that you need your files back, but we still cannot let you make a payment because this might not help you to retrieve encrypted data at all. Cyber criminals tend to take users’ money but do not give them anything in return, so the chances are high that you could not unlock a single file on your computer too even if you contact cyber criminals and then do as instructed, i.e. send money to them. One of our goals is to provide readers with the information that is credible, so we are not going to lie to you that we know everything about the Rpd Ransomware distribution. Since this infection has been detected only recently, the exact distribution method that is used to propagate it is still unknown, but, according to our experienced researchers who have analyzed hundreds of ransomware infections, it should be spread as an email attachment. Do not open any attachments from emails you receive, especially if you find them quite suspicious or they have been sent to you by unknown people/companies because you might end up with malware on your computer the second after opening such an attachment. Keep in mind that malicious emails might appear next to ordinary emails and look harmless. It is not very likely that ransomware infections are only distributed via malicious spam emails, so it would be best that you install security software on your PC to leave no chance for new malware to enter your system illegally. Files encrypted by ransomware infections stay locked even if the threat that locked them is removed from the system. Yes, you will not unlock your files by erasing Rpd Ransomware too, but you will be sure that it cannot encrypt your new files if you get rid of it today. We have asked experienced specialists working at pcthreat.com to prepare the step-by-step manual removal guide for your convenience, but you can choose the automatic method over the manual one too. That is, you can erase Rpd Ransomware using an automated malware remover as well. We want to remind you that these tools do not work as file decryptors. On top of that, not all scanners are reliable malware removers, so do not install the first scanner you find on the web using your search engine. Insert %WINDIR%\System32\Tasks in the URL bar and press Enter. Delete the file named Encrypter. Check all directories on your computer to find the malicious file launched and then remove it. Remove the copy of the ransomware infection (info.exe) from %APPDATA%. Delete the ransom note recovery.txt from %APPDATA%. Open Registry Editor (press Win+R, type regedit, and click OK). Delete two entries Encrypter_074 and userinfo from HKCU\Software\Microsoft\Windows\CurrentVersion\Run. Quick & tested solution for Rpd Ransomware removal.